It can help you recover ZIP password in case you forgot or lost the passwords for your ZIP/WinZIP/PKZIP archives. It is possible to decrypt or unlock password protected ZIP files using Crack PDF ZIP Password Recovery. 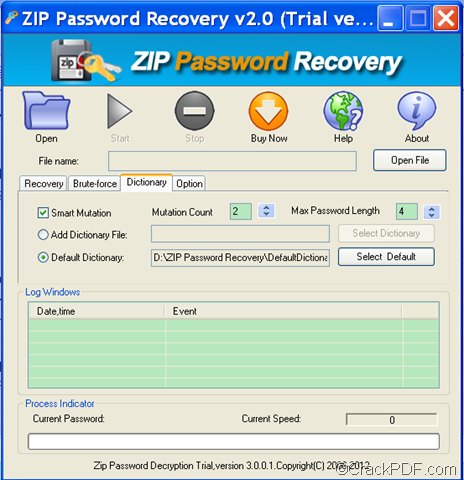 The following paragraphs are the instructions of how to use Crack PDF ZIP Password Recovery to recover password for encrypted ZIP achieves. 1. 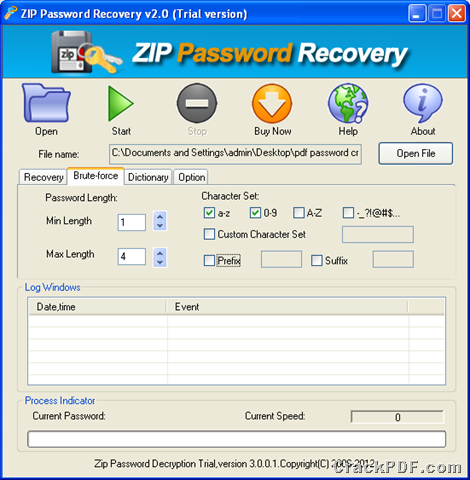 Please download Crack PDF ZIP Password Recovery and install the app on your computer. 2. Start the program by double clicking on the icon on the desktop. 3. 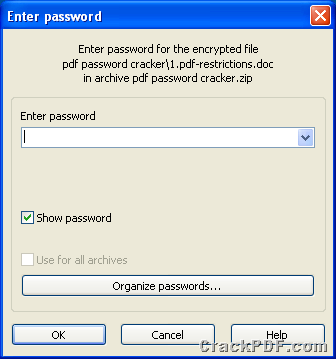 Add the encrypted ZIP file by clicking on the Open or Open File button on the panel to add the encrypted ZIP file. On the “Brute-force” panel, you can set maximal and minimal password length by directly inputting numbers into the “Min Length” and “Max Length” edit boxes or clicking the corresponding up-down buttons on the left part of panel. On the “Brute-force” panel, you can set character set in pure lowercase letters by checking the button of “a-z”, set it in pure numbers by “0-9”, set it in pure capital letters by “A-Z” and set it in pure punctuations by “-_?!@#$…”. What’s more, you can customize the character set by checking the button of “Custom Character Set” and then entering the set in the editing box. On the “Brute-force” panel, you can set the prefix and suffix by checking the buttons of “Prefix” and “Suffix”, then entering the prefix and suffix in the corresponding boxes. 5. Click on the Start button on the panel to start the recovery. 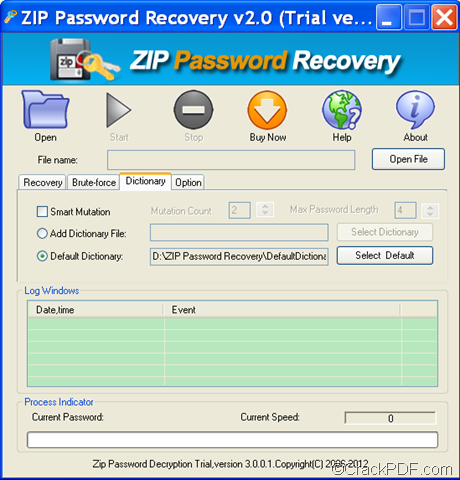 In no time, you will recover the ZIP password and have your password protected ZIP files decrypted! How to retrieve ZIP password? 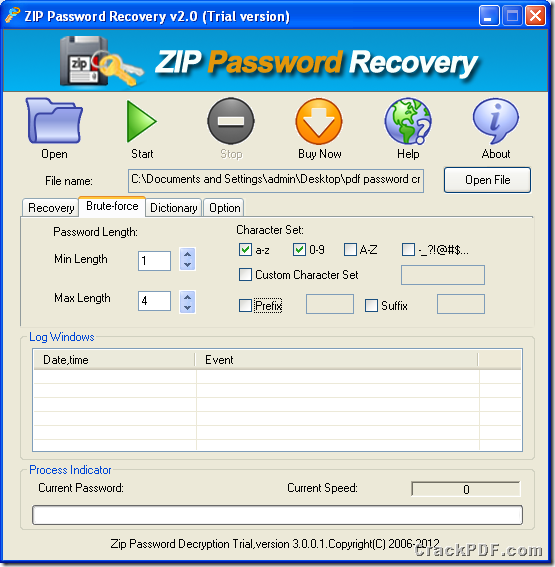 Crack PDF ZIP Password Recovery can help you retrieve ZIP password. 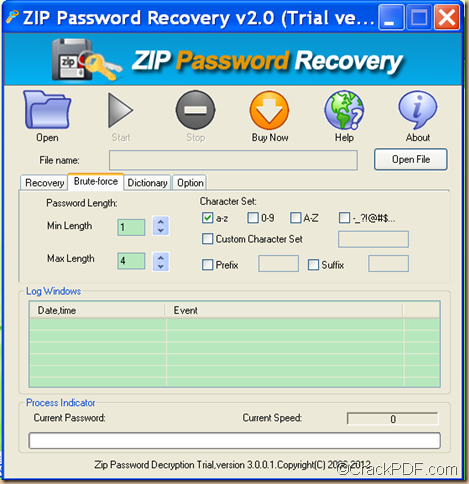 This article will discuss about how to recover password for ZIP/WinZIP/PKZIP achieves. Crack PDF ZIP Password Recovery is a practical password retriever that can retrieve password for ZIP archives in three strategies: Dictionary Attack (Recommended), Brute-force with Mask Attack and Brute-force with Mask Attack (Trying all Possible Combinations). 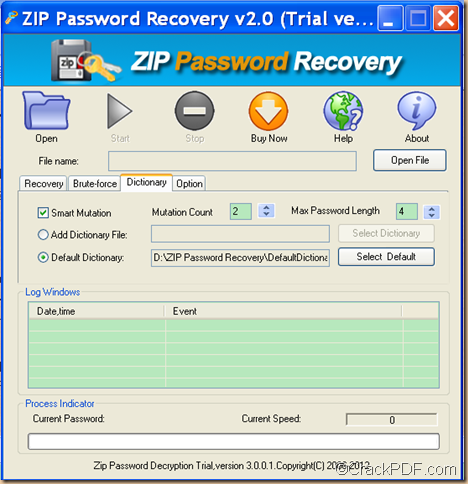 Firstly, please free download Crack PDF ZIP Password Recovery. 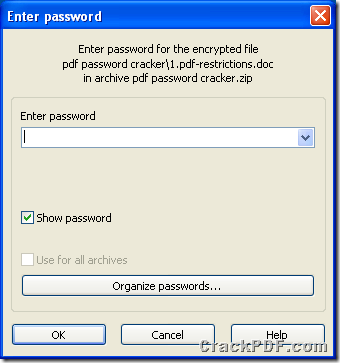 Thirdly, please click on the Open button or the Open File button on the main interface to add the encrypted ZIP file. 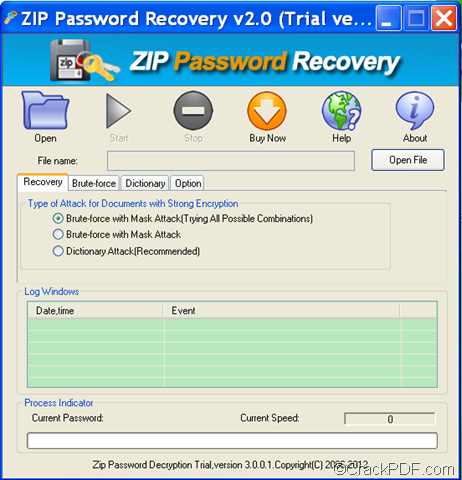 Lastly, if you can recall part of the ZIP password, please check the radio button of “Brute-force with Mask Attack” on the “Recovery” tab panel, then please click the “Brute-force” tab on the main interface. 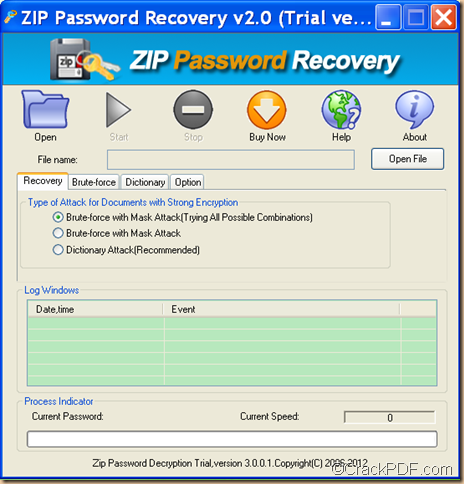 Then, you can set the corresponding parameters on the “Brute-force” tab panel and click the Start button on the the main panel to start to recover ZIP password. 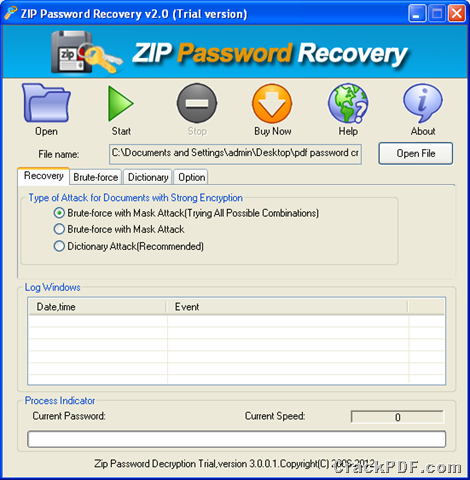 If you are blank about the ZIP password, please check the radio button of “Dictionary Attack (Recommended)” on the “Recovery” tab panel, then please click the Dictionary tab on the main interface to open the “Dictionary” panel. You can set the mutation count and max password length on the “Dictionary” panel.You can also add a new dictionary. 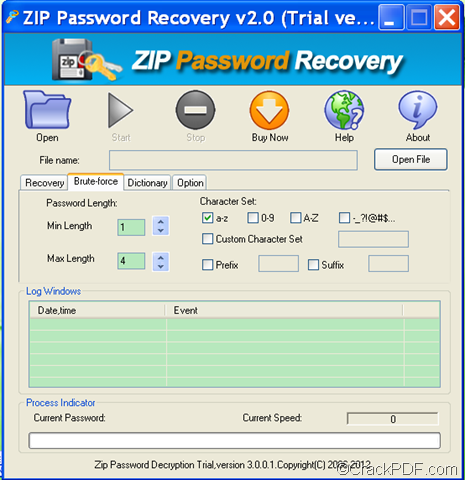 Then, please click the Start button on the the main panel to recover the ZIP password. If the above two strategies fail, the you can resort to Brute-force with Mask Attack (Trying all Possible Combinations). 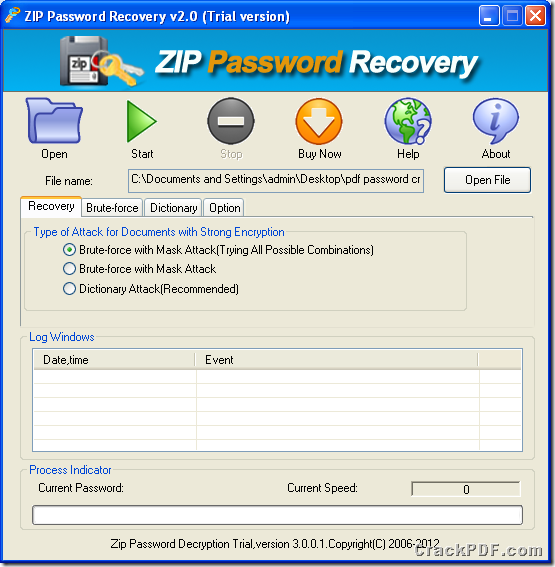 You just need to switch to the “Recovery” tab and check the radio button of “Brute-force with Mask Attack (Trying all Possible Combinations)” on the “Recovery” tab panel. Then, you can directly click the Start button on the the main panel to retrieve the ZIP password. 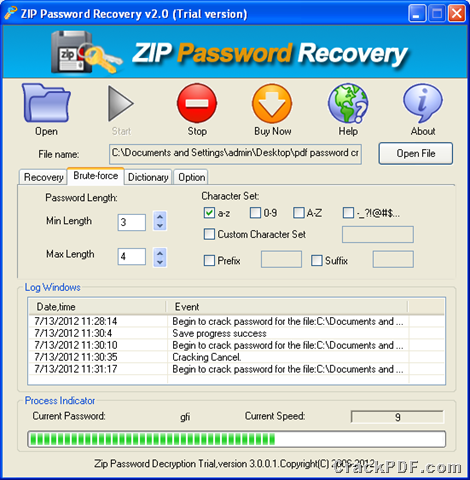 By now, as you can see, this is the end of the description about how to use Crack PDF ZIP Password Recovery to retrieve ZIP/WinZIP/PKZIP password. For any questions, please leave your comments here, we will reply you as soon as possible. 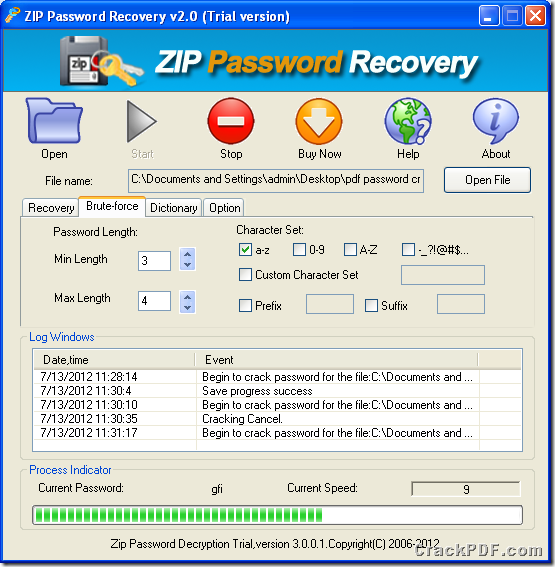 Crack PDF ZIP Password Recovery.